BabbleLabs’ breakthrough speech enhancement and noise reduction technology, now available through this Clear Cloud App, empowers professionals and amateurs alike to enhance the clarity and comprehensibility of speech in common format audio and video. This app is for anyone who loves high quality audio and is perfect for processing and enhancing real world video and audio capture in the moment. In whatever noisy environment you find yourself, use our app to record a video and then process it to enhance the speech and remove background noise. The app is a great tool for families, on-the-go journalists, social media enthusiasts, and content creators making short digital clips while out and about. 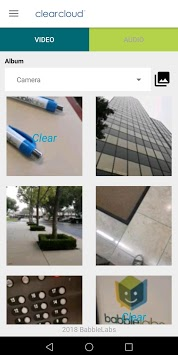 The Clear Cloud App is FREE to download. 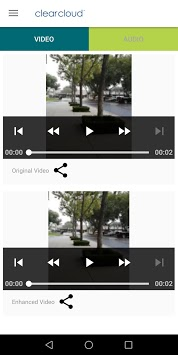 Once you have processed your first 125 minutes of video or 250 minutes of audio, the app will direct you to register an account on our web site at babblelabs.com. This app! It’s brand new and we’re excited. Let us know what you think by leaving a review. ***BabbleLabs is a member of the prestigious NVIDIA Inception program, designed to nurture startups revolutionizing industries through advancements in AI and data sciences. ***Red Herring selected BabbleLabs as a Top 100 North America Winner in June 2018. 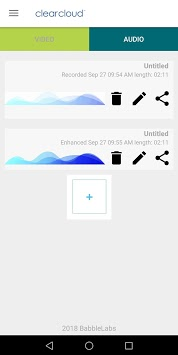 The Clear Cloud App turns BabbleLabs’ cutting edge innovations into an easy-to-use speech enhancement and noise reduction tool. Simply upload your audio or video file, and prepare to be amazed. Background noise is eliminated, and speech becomes clear, comfortable to listen to, and easy to understand. BabbleLabs’ extraordinary team of neural network researchers, speech processing architects, signal processing gurus, and audio software experts combines neural networks, DSP, and speech know-how to power breakthrough voice applications and devices. This app is an exciting part of BabbleLabs’ efforts to show the difference that enhanced speech quality can make for digital audio and video applications. The BabbleLabs Clear neural network has been trained with hundreds of thousands of hours of unique noisy speech data using NVIDIA V100 GPUs. The speech enhanced breakthrough results enable the technology to cover a comprehensive range of vocabulary, accents, languages, and capture conditions. Please visit babblelabs.com for access to Babble Labs Clear Cloud API and Babble Labs Clear Cloud Web interface. On our web site you will also find Gabby’s Lab, a gallery of user-submitted videos, plus: our blog, FAQs, support documents, news and events, and contact information.